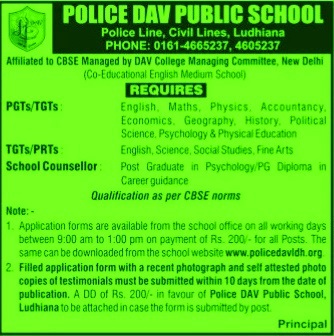 Police DAV School Recruitment 2019 News: Get Police DAV School Recruitment 2019 online as in this portal you will see all new job notices published by Police DAV Public School, (CBSE Affiliated) in coming months, till you may check previous circulars. Recently applications are invited for PGT, TGT/ PRT, School Counselor Posts. Interested and eligible candidate have to apply on or before 23 February 2019. Check online notification available at www.pdavpublicschool.com. More needed information of Police DAV Public School Recruitment 2019 regarding eligibility, experience, salary, and how to apply etc is mentioned below…….…. Computer Faculty – Proficiency in computer programming and E Learning command on classroom teaching and full knowledge of using smart school system. The interested job hunters have to submit prescribed application form available at school reception from 09.02.2015 or at official site pdavpublicschool.com and send at address mentioned below….….………..